SOFORT is a third party means of payment by Klarna Group. 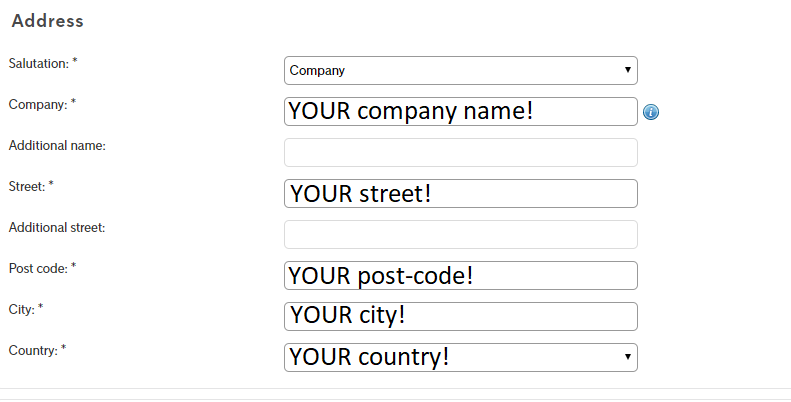 To process SOFORT via the Saferpay JSON API a few things must be observed. A valid acceptance agreement for SOFORT must be present. The SOFORT Project password (NOT the account password!). The Currency your customers will purchase with SOFORT. The ID of the Saferpay eCommerce Terminal SOFORT is to be added. Attention: For Sofort activation on the Saferpay terminal, please inform our activation service cs.ecom@six-payment-services.com about your Sofort credentials and the desired currency. Log-in to your SOFORT member area. Choose „New project“ and click „Create project“. Set the radio button for „Classic project“ and click again „Create project“. In the next step specify general settings for the project. Don't forget to deactivate the Test mode before going live! Specify the currency for your customer’s payments. Enter your IBAN for receiving your customer’s payments. For processsing SOFORT payments via Saferpay enter the redirect links. Scroll downn and click on "Save" to save your general project settings. Click on the tab „Extended settings“ to configure additional project settings. Go to „Shop interface settings“ in the "Extended settings" tab and enter the timeout value and link. Again click the tab „Extended Settings“ and choose „Notifications“. 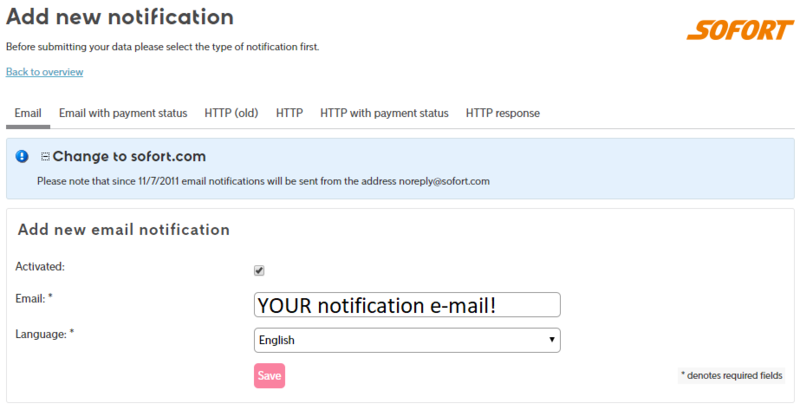 Click „Add new notification“ and add your email address to receive notification messages. Save and complete with adding the notification URL. As method choose „POST“. Finally create a project password. Click again the tab „Extended settings“ and there „Passwords and hash algorithm“. 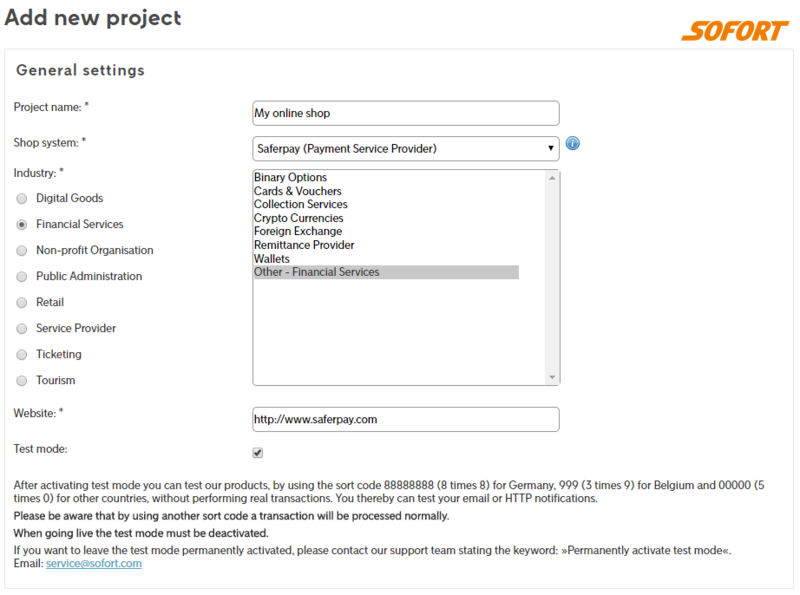 The settings for processing SOFORT via Saferpay are completed! Warning: Sofort does not support the iFrame Integration! Sofort/Klarna actively blocks the iFrame-Integration. In order to circumvent this issue, the Saferpay Payment Page will break out of the iFrame and display the Sofort website full-size, in order to make a payment possible. However, please keep in mind, that the ReturnUrls will also be displayed full-size!